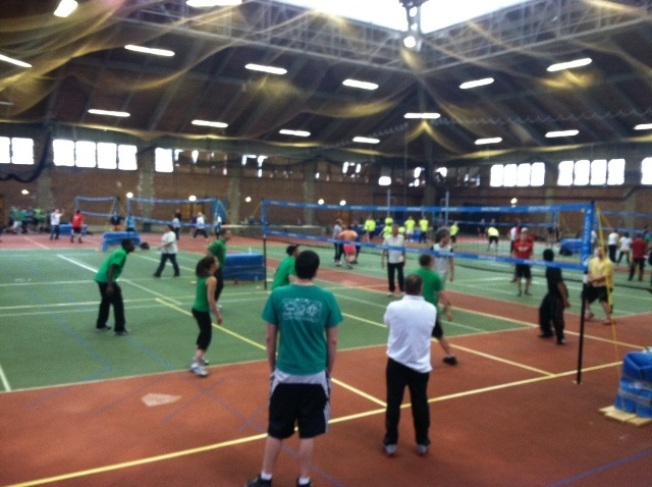 Dozens of teams compete in the 31st Annual Easter Seals Volleyball tournament at Trinity College in Hartford. About four dozen teams are crowding the gymnasium at Trinity College in Hartford this weekend to spike funds for Easter Seals of Connecticut. The local charity provides health services to people with physical and mental disabilities. “We cover people with individual disabilities, breast cancer rehabilitation, traumatic brain injury, stroke…we also have a vocational program that helps people to obtain employment,” said Mary Ann Slomski, the Chief Development Officer for the local chapter of the Easter Seals. Easter Seals has helped locals for decades. That is why so many groups were eager to take part in Saturday’s event and give the charity a boost. “This is our second year competing in the tournament. We had a great time last year, so we’ve tried to increase the energy this year,” said Joe Shiman. Not even NBC Connecticut could miss out on the fun. Our station is one of the event’s sponsors. Bob Connors, who works at the station, said he looks forward to the event every year. “We were champions several years in a row. We lost last year, so we’re back this year to try and win it all,” said Connors. One serve at a time, the annual volleyball tournament is a long-standing tradition that the Easter Seals hope to continue for years on end. “Since the inception of this event, it’s been over $1 million that have been raised,” said Slomski. The tournament runs all weekend with the final match being played on Sunday afternoon.